I like to let my reading follow its own natural course. By that I mean that I like to read whatever interests me at the moment. I want to follow my passion, as far as I can, and staying consistent with what my projects and my long-term goals call for. Recently I was excited to read The Dictator’s Handbook by Bruce Bueno de Mesquita and Alastair Smith; it gives a clear-eyed account of how politics at all levels really is driven by the basic imperative of power. That is, the functioning of all political organizations, from nation states down to your local strata council, is determined by the nature of the forces that keep the leader in power. The leader’s behavior is dictated, finally, by this dynamic: all leaders seek to gain and retain power, and they do whatever they need to in order to secure the continued support of their essential backers. In the systems we call democratic, these essential backers are many, and leaders in these systems necessarily have to enact policies that are congenial with large sections of the electorate. But in the systems we call autocratic, which form the great majority of political systems in the world, the number of essential backers is relatively small, and the method of holding on to power is always the same: to grease these backers as lavishly as possible. If you fail to do this, they will replace you with someone who is more forthcoming with goodies. Among many other things, this is why aid from the rich world to the poor world is almost entirely embezzled before it ever reaches its intended beneficiaries. That money goes to the bank accounts of the leaders’ backers. Mesquita and Smith have persuaded me that this is indeed the way the world works. But when I finished their book, I wanted to know more. What is power, exactly? How does its chemistry and plumbing work in human interactions and organizations? Where does it fit in psychological theory? I found that I urgently wanted to know why the world functions in the way described by these authors. Follow the passion! I searched Amazon.ca for books on power, but didn’t find anything that really matched what I was looking for. Possibly the psychological theories of Alfred Adler are a place to look; I made note of a book there. 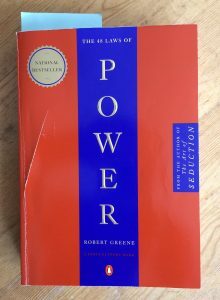 Then I thought about my own library, and remembered a book I got in December 2005: The 48 Laws of Power by Robert Greene. It’s a large, carefully produced paperback, and is a textbook on the strategies and tactics of gaining and holding power. Perfect! Once again, my own library held just what I was looking for. I’d started to read the book when I first got it, but was soon put off by its Machiavellian tone. I found the “laws” repugnant for the most part, and dismissed the text as a manual for psychopaths. Even though I had acquired the book as a tool to help me understand character construction in my writing, I found its message too depressing for me to wade through all 452 of its pages. I shelved it, thinking that I could get back to it later. Well, later has arrived: 152 months later. What was an unappetizing slog in 2005 has become a much more congenial, if still depressing, read in 2018. I’m now 129 pages in and have read 17 of the laws. What are these laws like? Law 1 (and I don’t know why they are ordered the way they are) is: Never outshine the master. When you’re under a boss who has power over you, your aim must be to make your boss look good: pass all credit up to him, and your own path to power will be smoothed. The other laws continue in this vein. If you’re a decent, good-hearted person, they are thoroughly dispiriting. They provide a detailed rationale for some of the worst human behavior. Maybe the most disheartening part is the attitude taken by the author: that everyone is really driven by these motives, and that a life spent pursuing power is a worthwhile one. Human happiness is much more connected with love than it is with power. Indeed, I suspect that power is what we seek—or one of the things we seek—when we feel, for whatever reason, that love is not an option for us. As a spiritual person and a caring human being, one who seeks love in his life and cares about others’ happiness, I cannot subscribe to the 48 laws of power. But I’m reading them anyway. For there are useful tips here which are not all necessarily evil, and furthermore, as noted above, most of the world is run by people who do subscribe to these laws—or would if they knew about them. And, even more importantly for the storyteller, power is a key dynamic in every story, and the storyteller is well advised to become educated in its dark alchemy. Help me create more by becoming one of my Patreon patrons. If you’d like to support my work without spending money, I have just the page for you. This entry was posted in thoughts and tagged Alastair Smith, Alfred Adler, Bruce Bueno de Mesquita, Carl Jung, Love, Machiavelli, power, Robert Greene, the 48 laws of power, the dictator's handbook. Bookmark the permalink.